Well, you can get your fill with dim sum! Here are some etiquette tips for first-timers to follow. With the Lunar New Year coming, you might be looking for a way to celebrate. Although commonly associated with the Chinese culture, the Lunar New Year is celebrated all over Asia. During the ordinary New Years celebration that is marked worldwide, one of the traditions is to eat. 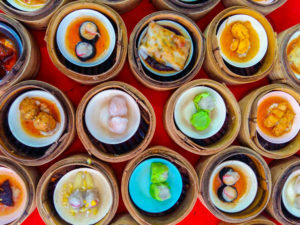 Well, you can get your fill with dim sum! Here are some etiquette tips for first-timers to follow. Wherever you go out to eat at a typical restaurant, ordinarily, you get one entree for yourself and decide to share appetizers and dessert, if at all. That doesn’t necessarily need to happen at a dim sum establishment. When you bring a larger party, you will be able to eat more, so don’t hesitate to share what you order! Tea is one of the best parts of any dim sum meal. Most restaurants will give you water when you are seated, so ask for some water, too. However, you can request different flavors of tea, if you wish. Before you pour it, make sure that tea has been steeped long enough for your liking; the longer the tea is in, the stronger it gets. Flip the lid or leave it open to indicate that you would like the pot refilled once it’s empty, and be sure to fill everyone else’s teacup before your own. Unlike most eatery settings, you order what you want based on what comes to your table. Most of the time, nodding or saying yes is all you need to accept a dish for your table; even if you’re unsure of what you’re getting, give it a try anyway. You might find that you like it and will look for it the next time. Plus, if you’re looking for something in particular that you haven’t seen circulating, you can place a special order from the kitchen. It’s understandable if you’re reluctant to get up and chase the cart. After all, you don’t want to cause a scene or disturb anyone else’s meal! That said, you can go after the cart and get the item that you want, especially if it has reached the other side of the room. Just be sure that whatever it is you want, you don’t take the last one. It’s still considered bad form to do that. This entry was posted on Friday, January 25th, 2019 at 12:21 pm . You can follow any responses to this entry through the RSS 2.0 feed. Both comments and pings are currently closed.